Talking about emerging brands, Thurso Surf has got to be one of the prominent new brands whose light can be caught from a distance. Indeed, this brand might not be on the top list today but it seems that it’s about to change. The best thing about Thurso Surf is their ability to present its clients with a board which you cannot complain about and that boils down to various little reasons. Take the example of the Waterwalker; without exaggeration, this is an exemplary board on so many aspects, making it one of Thurso’s best sellers of the year. So, what exactly makes this iSUP a premium choice and why should you get it? One of the first things you should be looking for in any inflatable paddle board is its dimensions and not only because of performance but also you would want it to fit. Accordingly, the Waterwalker comes at a comprehensive 10 feet and 6 inches in length. The reason we describe it as comprehensive is because it is compatible with most paddlers out there. So, if you’re an adult, a young adult or even a teenager then this board is the right size for you. Also, at this length, the board at hand is set to perform at an impressive level which will be further discussed under the performance tab. As for width, the Waterwalker does not take any chances and goes for a comfortable 31 inches which should eliminate all of your concerns as a beginner. Indeed, balance and stability are made much easier with a board this wide, enabling you to adjust yourself comfortably and continuously without the risk of accidentally falling in. Also, at 31 inches, you’re granted a much wider platform to navigate the board in a smooth and steady way. Last but definitely not least, thickness makes a critical dimension for inflatable paddle boards especially because thinner boards are prone to getting bent at the center under excessive weight. Hence, to completely get rid of this concern, Thurso Surf decided to go with a 6 inches thick hull on the Waterwalker. Thus, not only will the board keep you high and dry (positively) at all times but it will also stand strong in the face of time and multiple passengers. PS: The Waterwalker has a maximum weight limit of 280 lbs. PS : The Waterwalker is also available in 11′ size. Quality is evidently one of our biggest concerns as paddlers because the last thing you want is a punctured board in the middle of your adventure. Accordingly, Thurso Surf made sure to get it right on this board so that you don’t have to worry about anything as you paddle away. Indeed, one of the most prominent aspects of the Waterwalker is the fact that it is completely made out of industrial grade PVC material which is a substance so robust that it is used in some of the most critical constructions known to the human kind. Furthermore, the board also features an industrial drop stitch construction, perfectly sealing all seams on the board for once and for all. Truly, this is the type of construction that we all deserve as it has proven once and once again to be 100% reliable. A quick look at the board wouldn’t be enough to comprehend what’s going on but a second will definitely spot that large gripping pad covering the entirety of its lower half. Truly, the RVA gripping pad must be one of the best features on this board if not the best because not only will it grant you a firmer grip on the board but it will also enable you to better command it as you go. Paddlers’ reactions are all over the place when it comes to D-rings but iSUP manufacturers are still going strong with them. So, that can only mean one thing; most people actually appreciate them and that includes me. Accordingly, the Waterwalker comes with an impressive set of 9 D-rings: the first is placed on the tail of the board and it is meant to help you tow / secure it easily, 4 are on the center area which are meant for installing a kayak seat and 4 rings on the nose of the board which can be used as a cargo net thanks to the connecting bungee cord. 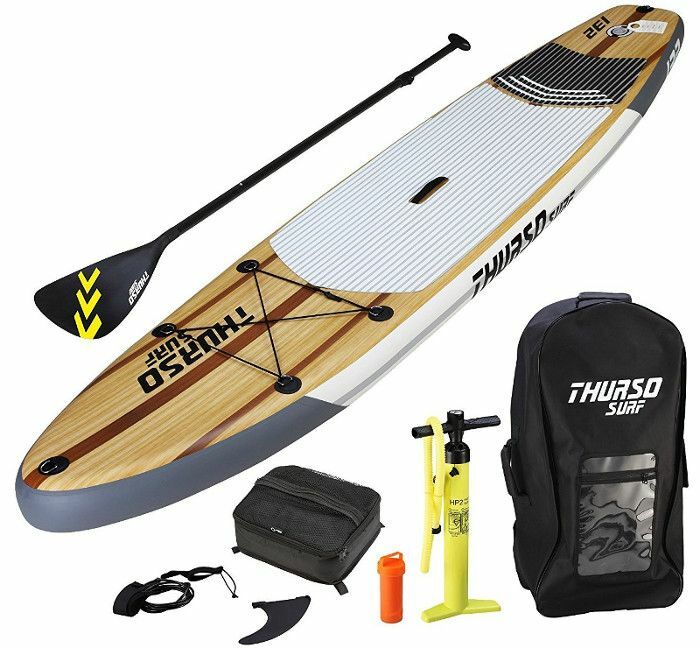 As for convenience, Thurso Surf hooks this board up with a practical carry handle on the nose of the board to make it easier for you to tow it outside water or have someone help you carry it on land. However, if you’re on your own then you can always use the carry handle at the center as it will enable you to transport the board individually. The best feature on the Waterwalker however has got to be the triple fin navigation system. Indeed, not only is this a reliable and swift navigation system but practically all 3 fins can be removed whenever needed, allowing you to store the board or use it as you wish. Performance is certainly a bigger deal for some of us than it is for the rest but one thing is certain and that is the Waterwalker is going to impress both categories. 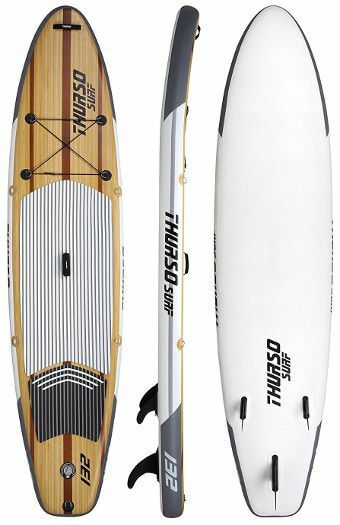 Indeed, this might not be the premium end professional paddle board but it is a highly advanced entry level board with the capacity of competing with high calibre boards. In that respect, the Waterwalker’s tight and fluid hull is certainly going to have a substantial influence on the performance of the board and consequently result in an improved navigation and command. Moreover, speaking of navigation, the board’s triple fin system is going to lure in some of the smoothest straight tracking which can only be achieved thanks to the smaller side fins whereas the central fin will enable you to cruise swiftly and without hesitation. 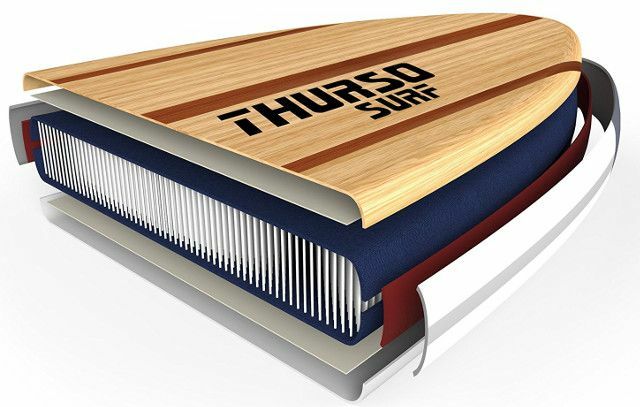 The Thurso Surf Waterwalker comes in an all-inclusive package.